Football season is here, and there are wings to be made and eaten by the dozens! 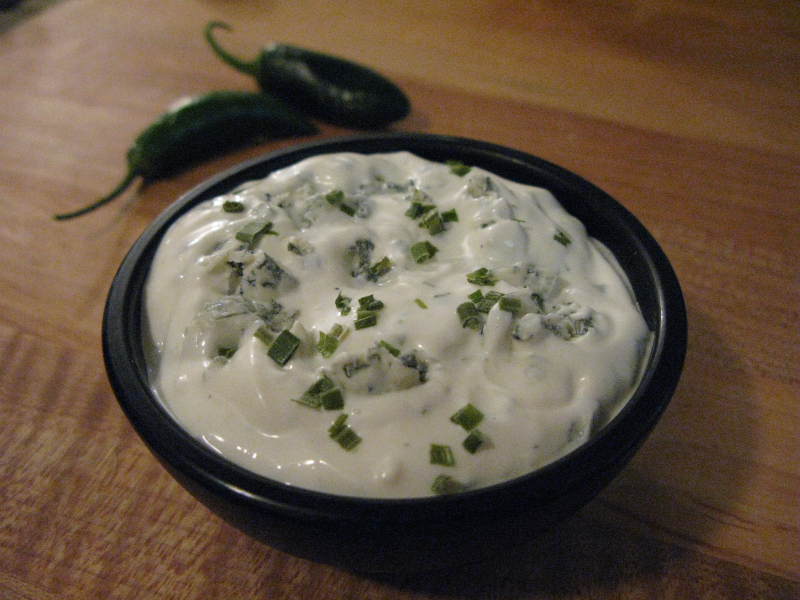 And to go with those wings, you’re gonna NEED this easy to make blue cheese dip recipe. This is now our go-to, in house, gotta have, blue cheese dip for wings and veggies! An it’s so easy, you’ll never go back to Marie’s or those other dips-in-the-store. Really. Blend all ingredients in bowl, chill at least 1 hr for flavors to marry. Serve with hot wings & celery, or with a salad. I was fooled… I thought you would add jalapeno to the dip (from the photo… and your reputation proceeds you). This is just about exactly what I make, I don’t use any salt (I am old, Doctor gonna order it any day now, so may as well start), and I add juice from half a lemon. My wife lets me notch up the wing spices if I have a cooler dip on hand. .-= A post from My Year on the Grill’s blog …How to GRILL an APPLE PIE Stuffed with CHEDDAR CHEESE =-. Hey Dave, thanks for the jalapeno idea! Oh yeah, that would go perfectly with some smoked hot wings! Thanks for posting, I’m book marking this to make this weekend. .-= A post from Chris’s blog …Stuffed Pork Loin With Tomato Cream Sauce =-. Woo hoo. Hope you and your crowd like it! I’d love to learn more about your “smoked hot wings”. Hook me up with the smoked hot wings recipe! What a great idea! This will be so much better than the store bought dips I normally buy. Thanks. BEST WINGS I EVER HAD!!!!! Could someone please tell where I can buy Sweet Chili Sauce? Kikkoman used to make it but I cannot find a place to buy any. this is my dip, my only dip now just squeese 1/2 lime add two tsb diced jalapeno and two cloves of galic put hrough a press, then your home free. An interesting addition for sure. We just might have to try it. Thanks Jesse! Thanks Sam! Quick and easy, huh. We love it here too.